When vocalist Brian Hyland set out to reinvent himself in the late ‘60s, he already had a couple of hit singles to his name, including “Itsy Bitsy Teeny Weeny Yellow Polka Dot Bikini,” a novelty song he cut at the tender age of 16, and “Sealed With a Kiss,” recorded two years later. 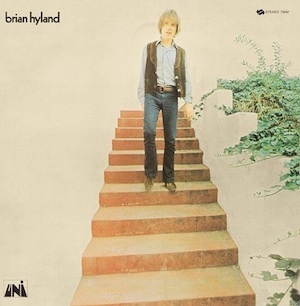 But those bubblegum gems don’t really indicate where Hyland would head with his self-titled 1970 record, a remarkable album of soft psych, blue-eyed soul, and power pop. Del Shannon, no stranger to the pop charts sat in the producer’s chair, and was clearly keen on making a contemporary record, sifting through Summer of Love psychedelic sounds as well as traditional pop songcraft (for an example of the guy’s headspace, check out his take on the Stones’ “Under My Thumb”). What the two cranked out at Sound Factory in Hollywood stands up today. The album produced one smash, a gorgeous cover of Curtis Mayfield’s “Gypsy Woman,” which came armed with a string arrangement by Harry Nilsson collaborator George Tipton. It’s the record’s most accomplished moment, but it’s not the only stunner on deck. Opening track, “Maria/Somewhere” reimagines the West Side Story selection as a soft-psych ballad, with woozy strings and sparse fuzz guitar. “Slow Down” is the record’s most swaggering moment, a slice of Moog and stomp-box boogie rock. “Driving Me Crazy” has a chiming Badfinger quality (and it’s the kind of thing that fellow teen star-going-legit Alex Chilton was writing over in Memphis at the same time). Folk rock closer “You & Me,” penned by Shannon and Hyland, blossoms from a slight country shuffle to an expansive, anthemic bridge before settling back into its easygoing groove. Wow, the strings in “Gypsy Woman” are incredible. The first verse reminds me a bit of Kenny Rogers’ “Just Dropped In (To See What Condition My Condition Was In). I love the original Impressions’ version, but this adds a new level of bittersweet wistfulness to the song. Especially with those gypsy guitar licks thrown in.